It's been 30 years since a Brazil man's daughter died in a brutal unsolved double homicide. 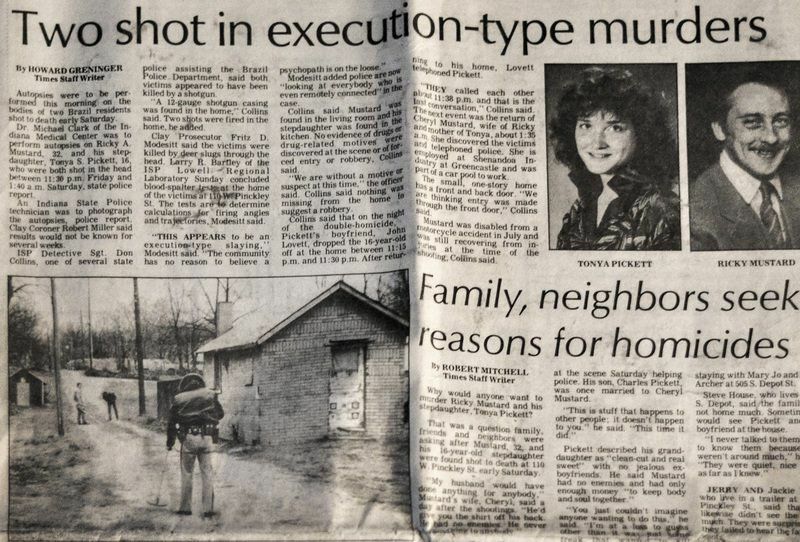 Sorrow over the shooting death of Tonya Pickett on Nov. 18, 1988, remains with her father, Norval “Chuck” Pickett. This year, his sorrow prompted Pickett to give his first interviews about his daughter's death 30 years ago in hopes the case will finally be solved. Tonya Pickett was 16 when she and her stepfather – 32-year-old Ricky Mustard – were shot and killed at their Brazil residence in the 100 block of West Pinckley Street. The teenager's mother found the bodies when she returned home. Chuck Pickett, nephew of the late former mayor Norval Pickett Jr., said he thinks Brazil Police botched the investigation at the time. He said he always felt Tonya's boyfriend should have been the prime suspect, because the couple was seen together at a basketball game, dance and a restaurant in the hours before Pickett and Mustard were killed. Witnesses also told police the couple had been arguing that evening before the teenager was dropped off at home by her boyfriend. That boyfriend, however, was not arrested until 2008, after the unsolved homicide was re-investigated by Indiana State Police. Pickett said he was pleased when the man, John Lovett of Brazil, was indicted by a grand jury and charged with the homicides. But Chuck Pickett was dismayed by the dismissal of those charges in 2012 after the Indiana Court of Appeals ruled some undated letters between Pickett and Lovett could not be used as evidence in the case against Lovett. The original investigators in the case have since retired. Brazil Mayor Bryan Wyndham said no one currently working for the Brazil Police was a part of the original investigation. Police exhausted the leads they had at the time. No weapon was ever found. Both Pickett and Mustard were shot in the head at close range. Pickett said he is still upset the case has not been solved. He hopes someone who has information about the case will give police the facts they need to make an arrest. Anyone with information can call Brazil Police at 812-446-2211.